Karen Lynch has been the CEO of the social enterprise, Belu Water since 2011. Under Karen’s leadership, Belu launched a new business model and set out to exemplify environmental standards in the bottled water industry. The business also pledged to donate all profits to end water poverty through an exclusive and contractual partnership with WaterAid. Having previously pursued a corporate career in media at Emap plc (1989 – 2003) and finance at Barclays (2003- 2009), Karen became obsessed with waste and a desire to make a difference beyond satisfying shareholders in the traditional way. She explored the third sector and identified the opportunity to reinvent Belu. Through delivery of a series of industry firsts, Belu indeed offers the most ethical choice in water service whether bottled mineral water or filtration and reusable bottles and carafes. 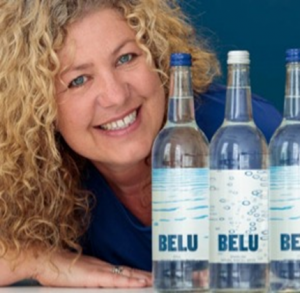 Belu income is all from trading and so far, that has also enable the business to pass £2.2 million to WaterAid, transforming over 140,000 lives by providing access to clean water and safe sanitation. With Karen at the helm, the company has been recognised with many awards. Belu was the first (and remains the only) UK drinks business to achieve the independent British Standard of carbon Neutrality PAS2060. Most recently and notably, The Queen’s Award in the Sustainable Development category in April 2018. Everyone who demonstrates selflessness and resilience. 1) Do something you know you are good at. 2) Focus more time on planning how to pay funds back than on securing them. 3) Don’t spend – invest. Finding a business model that works, allowing a relatively small business to compete successfully in a market with some huge brands.